We’ve quickly moved into a space where time runs together. This happens on vacation, pilgrimage, silent retreat, backpacking trip. It’s hard to keep track of details, and yet the richness of experience continues to flow. This is as it should be. This morning we attended Mass at St. George’s Cathedral, the Cathedral Church of the Diocese of Jerusalem. The Very Rev’d Hosam E. Naoum, Dean of the Cathedral, officiated the Mass and provided the sermon. We had a chance to have tea and coffee with him and several parishioners afterwards. 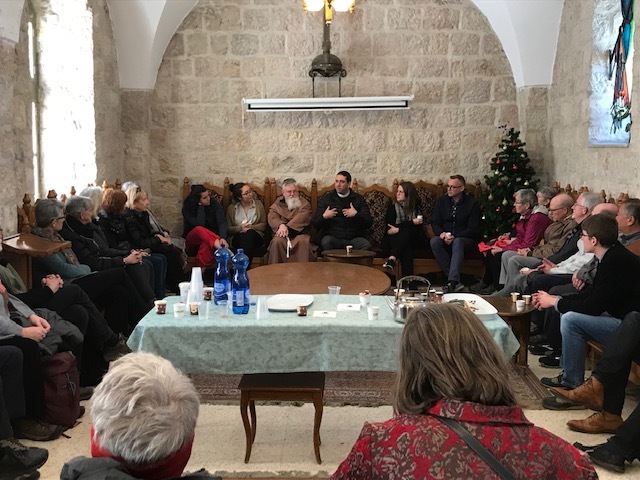 He shared with us a brief history of the Cathedral, an overview of the Diocese of Jerusalem, as well as the diocese’s ministries here in Jerusalem. The Diocese covers an amazing, and amazingly complex, geography – including not just Jerusalem, but also parishes in Jordan, Palestine, Israel, Syria and Lebanon. He spoke of the ministries they provide: health care services, educational programs and other humanitarian work. He also spoke of the role of the Diocese, and Christians in general, in ongoing peace and reconciliation efforts between the various religious groups and nation states wrestling for control of this land. While commenting on what drives him in this work, he noted that we are a people of hope. “And remember,” he said, “right near here is the empty tomb.” The empty tomb is the source of hope at the center of our faith and at the center of the day-to-day lives of people living, working, and praying in Jerusalem. It is this hope, the Dean was quick to remind us, that inspires him and many other Christians in the region, in spite of devastating conflict and struggle. Christ has risen! 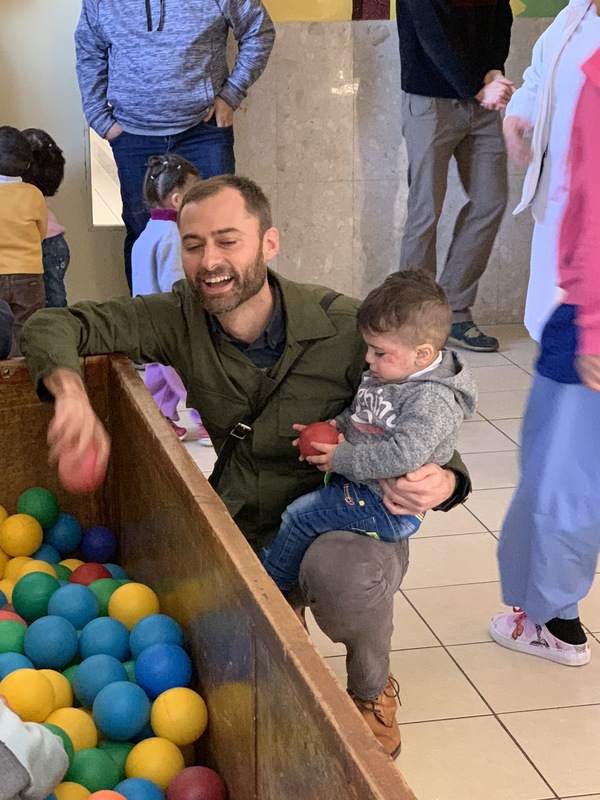 And this relates to a final ministry Reverend Naoum mentioned – the role of the diocese in supporting the pilgrimage of Christians like us. In talking about pilgrimage, the Dean distinguished between encountering what he called “ancient stones” and “living stones.” The ancient stones are the ones we visit, snap pictures of, and read about in pamphlets or books. The living stones, however, are the lives of those impacted by an encounter with the story told by the ancient stones – the story of hope. And what distinguishes our pilgrimage from a mere Holy Land tour, is that we are here to encounter not just the ancient stones, but especially the living ones. We have been blessed to encounter many such living stones while here, as we did while visiting the children at St Vincent Creche/Orphanage; listening to Rev. Dr. Mitri Raheb speak of the role of Dar al-Kalima University in changing the lives of the Palestinians students who attend; or listening to the stories of our fellow pilgrims, especially as they describe their encounter with this place. Ghassan, our tour guide, has said several times that a given site may or may not be the actual place where this or that biblical event happened. The importance of these places lies not so much in geographical accuracy or specificity, but how these places have given birth to a story of hope that transcends time and place, changing the lives of those who believe. It is the story of this place that has meaning, not just the physical location. Being so near these sites merely provides us a more enlivened encounter with that story, the story of the greatest hope of all. For those of us who are blessed to be on this pilgrimage, I pray that our experience here may make us living stones, perhaps just a little more so than the start of our pilgrimage. For our loved ones, family and friends reading this blog from a distance, I pray that your lives too are changed by your own encounter with the story of hope, even if it you are reading this from a bit further away from these ancient stones. The dean (the first indigenous dean, he told us) says pilgrims to the Holy Land who do not meet the local church have come to see the dead stones – the one rolled away from the tomb, the one that Jesus prayed on in Gethsemane, the ones that form the Holy Sepulcher or the Church of the Assumption – but they forget about the living stones, the faithful who make up the church today. These Palestinian Christians have a hard road to walk. 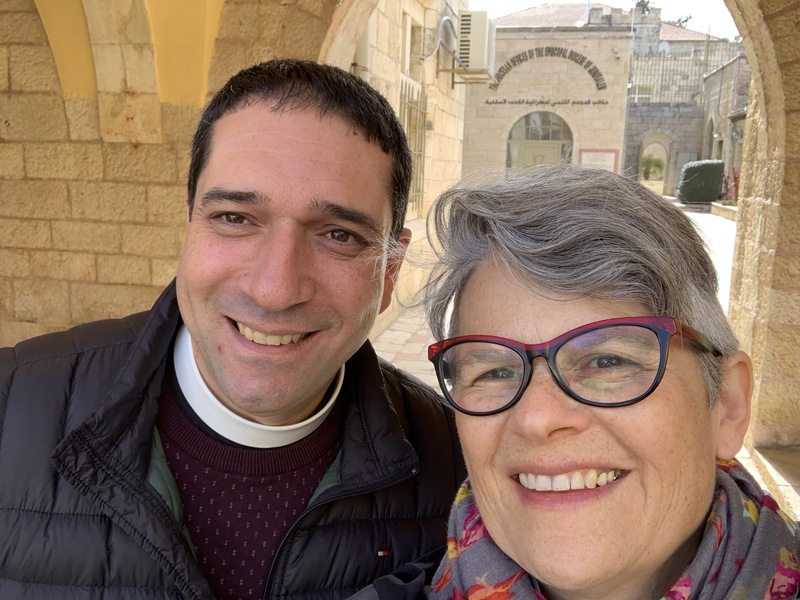 The dean explained that though he is Palestinian, he carries an Israeli passport and cannot visit churches in several countries in his diocese, including Syria and Iran. The bishop himself has just visited the episcopal church in Damascus for the first time in almost 6 years (it is still thriving). My 40 minute bus ride to church pales in comparison. As I look around at my fellow pilgrims, I think how they are, too, are living stones. These people I have the honor to love and live with, these are the stones of my church. You who are in Seattle and you who are far away and you who make up the faithful wherever you live. You are the living stones. 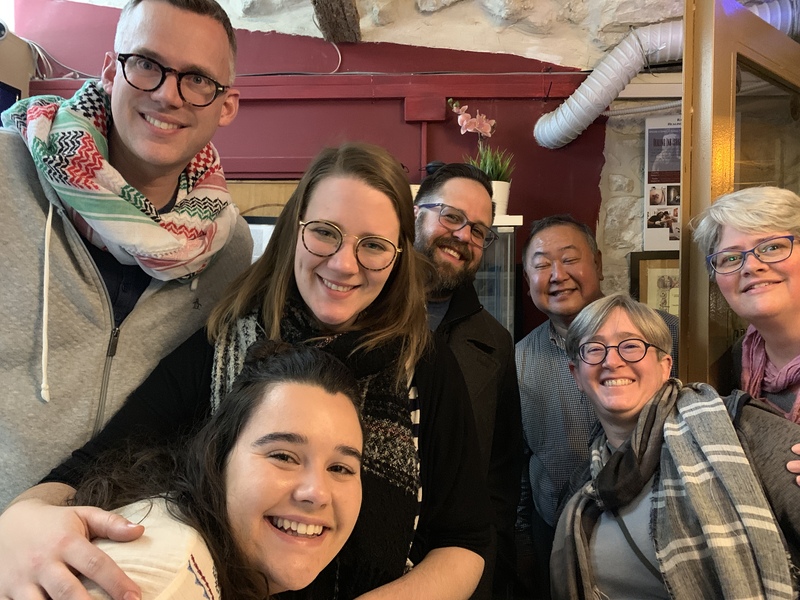 Seeing you, speaking with you, praying with you, riding a bus with you and a scouting out pomegranate juice with you — these are actions that make pilgrimage a lifelong endeavor. I am so grateful for the opportunity to be here to see these “dead “stones, these ancient foundations of the faith that have been built upon over and over and over, that have been prayed on for millennia. I’m grateful for the chance to celebrate the Eucharist with believers in Jerusalem. I’m grateful (eternally) for the living stones I get to take back to Seattle with me and those who are waiting for our return. I’m grateful to be on a lifelong pilgrimage together every single day.